1. Welcome Jenny! Can you tell us a little about your latest book, ROSIE HOPKINS’ SWEETSHOP OF DREAMS? It’s about Rosie, a nurse. She has to go and look after her elderly great-aunt in the countryside, and wind up her affairs, which is when she realises that her aunt’s old sweetshop could be brought back to life. 2. You also have a book called MEET ME AT THE CUPCAKE CAFE. What do you love about writing stories with a food theme? Oh I’m just greedy, really. It’s a nice way to incorporate two things I love to do; baking and books! 3. Did you always dream of becoming an author? When you were little was there anything else you wanted to be when you grew up? Ha, I wanted to be a nun. Or a writer, yes. But I never really thought it would come true, I still pinch myself sometimes. 4. Is food a big part of your family’s life, and what do you love cooking the most? I never used to cook at all, I was absolutely awful, until my first child was born and then I thought, no, I must cook for him, I don’t want him having too much processed food. So I have learned, but it’s been very touch and go. Some things are better than others! I make a great lemon chicken and my stews are good but the less said about my bernaise sauce the better 🙂 I am not a natural chef, that’s for sure, I have to work at it. 5. If you could name three essential ingredients that make up a great novel, what would they be? Characters you care about is sometimes the only thing I think is important. If you like/ care about the people, it almost doesn’t matter what they get up to after that, you’ll follow them anywhere. If you don’t care about them, the cleverest plot in the world won’t help you. 6. If you could have dinner with anyone in the world, who would you choose? Ooh does it matter if they’re alive? I would have LOVED to have met Douglas Adams, he was such an inspiration. Richard Feynman too. Alive, I suppose the Obamas would be SO interesting, if they could actually tell you anything. Ha, and Stephen Moffatt, because I want him to give me a job 🙂 . 7. Do you have any words of wisdom for aspiring authors? YES! But no-one ever listens to me! The only thing that ever works is typing every day. Not research, not editing, not playing about on the internet. There’s no such thing as the muse and there’s no such thing as writer’s block. Bum, seat, words- 1000 is a good starting point- every single day. That’s the job. Doesn’t matter if you think it’s rubbish, fix it in the edit, that’s what editing is for. But until the words are on the page, you have nothing to work with, and you can’t get started. I always say this and no- one ever wants to believe me, but it’s a universal truth I’m afraid. 8. Are you working on another book, what’s next for you? Yup, I am working on a book about lovers in Paris who work in a chocolate shop, and I have a book coming out in July for Doctor Who, called Dark Horizons. Then Christmas at the Cupcake Cafe comes out in October, and I’d like to write a sequel to Sweetshop, so we’re very busy! Thanks for being on the blog, Jenny! 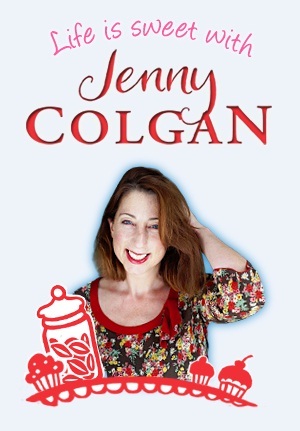 Jenny Colgan’s books have been described as ‘sharp and witty’ (Observer), ‘funny, magical, and moving’ (Time Out), and ‘hugely entertaining and very funny’ (Cosmopolitan).Visit Jenny’s website and check out her books here . Posted on May 24, 2012, in Interviews, Mouthwatering May and tagged author interviews, books, chick lit, jenny colgan, Mouthwatering May, women's fiction, writing. Bookmark the permalink. 5 Comments. Love your books Jenny!! And love your advice for writers. Must HEED!! That really is the best writing advice – bum, seat, words. Love it! I’m late, but am really enjoying these posts, Juliet! I love Jenny Colgan’s books! It’s the perfect read for those afternoons when its sunny outside and you just camp out. Or to read at home when its raining! It gives me such a warm feeling. I’ve red 3 of her books so far and I loved all of them. 🙂 Great interview! That’s great! Nothing like a good book, and foodie books – even better! Thanks for dropping by, Emmeline and nonfashionista!